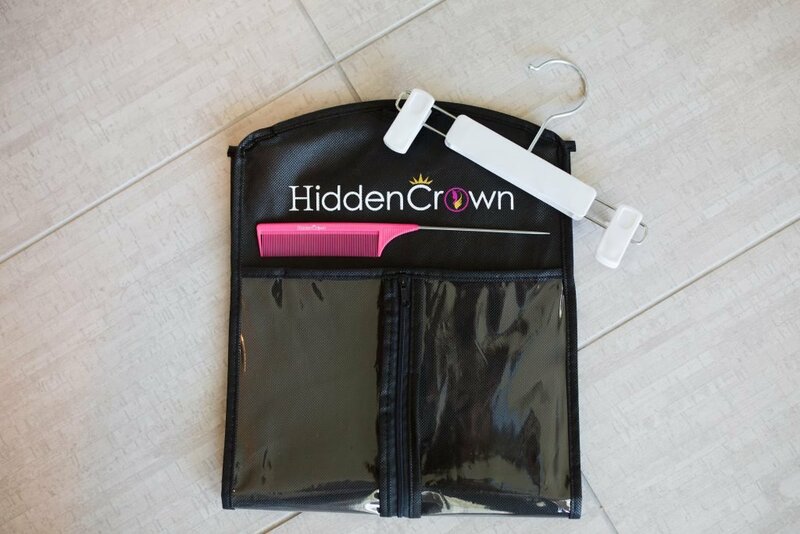 Hidden Crown Hair Extensions! To give you a little background, I have great hair that has tolerated years of coloring and heat from styling tools but there’s a point at which it just won’t grow any longer and becomes stringy and unmanageable. That’s when I usually end up chopping it off and inevitably regretting my hasty decision… This time I wanted to try something different. It began as a way for me to NOT cut it all off but instead give it a chance to stay long and get the look I was longing for. I started with clip-in extensions and fell in love. They worked well and I got so many compliments, most not knowing they were extensions at all! I was thrilled and started wearing them everyday. If you’ve worked with clip-ins before you know that they pose their own set of challenges. With my fine hair I was teasing the individual pieces to get them to hold all day, which was hard on my hair and became pretty time consuming. After a few months of doing that I decided to go on the hunt for something better. When I first discovered Hidden Crown I was terribly skeptical. I researched EVERY-THING. I searched bloggers that had worked with them, watched every Youtube video there was and went back and forth for weeks before deciding to order. It just seemed too easy, but I was desperate to find something better. Right off the bat the most impressive thing was their shade matching system. I sent in a photo (in good, natural lighting) and they responded the next morning with my shade recommendation! I also loved that in my package they automatically sent a swatch of the next lighter color as well as the darker color in case I needed to double check my color choice. I was then able to either send them back to be replaced or clip the ties on the packaging which, at that point, makes them non-returnable. Mine was a perfect match! Since my hair is a bit Ombre I matched the lighter tones towards the bottom of my hair. These extensions are 100% natural Remy hair and the softest ones I have ever had! 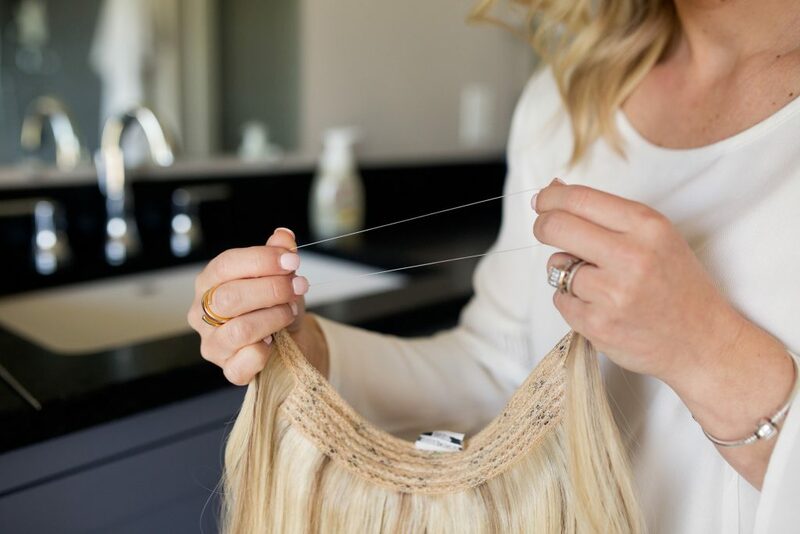 All of the extensions come with a travel bag, a clip hanger, as well as the comb you will need to pull your hair up and over the Hidden Crown hair piece. As you can see it fits over the crown of your head like a headband. It has a good amount of stretch to it and is very comfortable to wear. I rewired my piece (I highly recommend watching all of their videos here) which leaves you with a double strand to work with. I separate mine into two strands (pictured above) and pull my hair up and over both wires. I find that doing this evens out the weight of the extensions and makes them even more comfortable on my head. As you can see the wire is completely invisible and takes about two minutes to put in place, and removing it is just as easy! I always take my new extensions to my hairdresser for a hair cut (I guess it would be a weave cut, ha!) to make them look more natural – you certainly don’t have to cut them, that’s just what I prefer. The extension I am wearing is the 16″ Ash Blonde with Lowlights Halo. 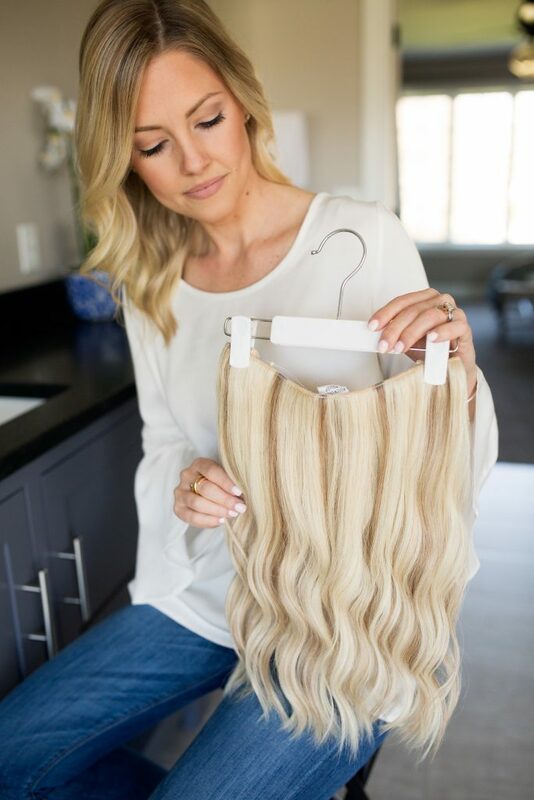 If you are looking for something that looks a little less mermaid-like they also offer a Daydream Crown in each color option – this set has less grams (weight) with tapered ends. It comes at a lower price point too, so there really is something for everyone! I am actually considering ordering one of those for the upcoming summer, and the heat! Your extensions will come straight and it is best to curl them WITH your natural hair. After you put the extensions in split your hair in half down the back and pull all of the hair forward over the shoulders on either side. 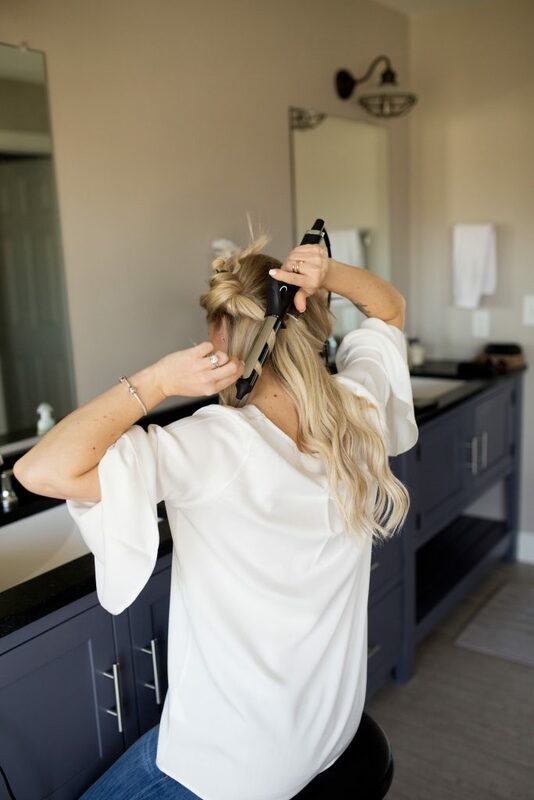 Clip the top half up on each side (think Princess Leia) and curl small chunks starting from the back and working your way forward. 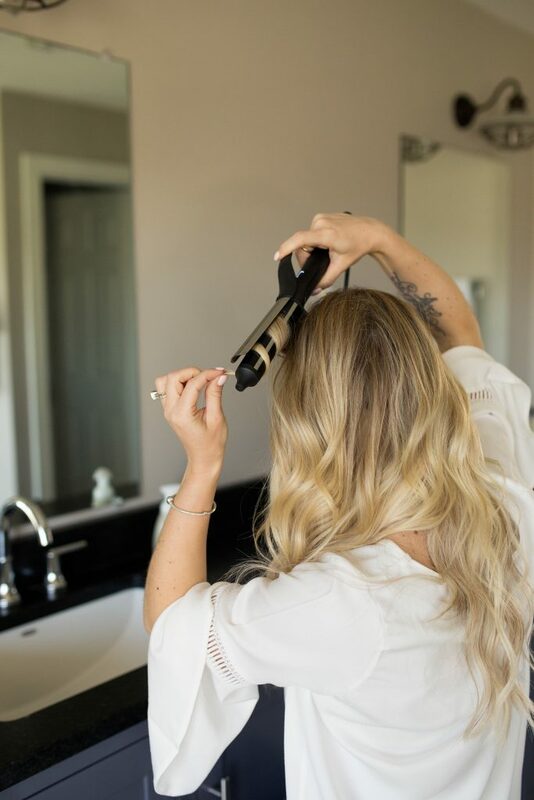 For the top start on one side, curling the hair around the iron twice and moving up and down (holding the clamp open to use like a wand) always curling away from the face. 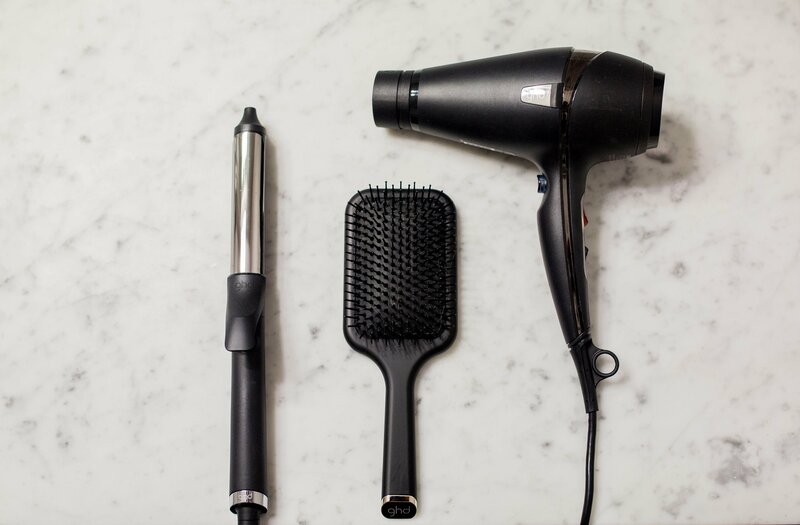 The movement of the iron makes for looser, bouncier waves instead of tight curls. Allow the curls to cool completely, even if they seem too tight. They will fall a little through the day and stay for days! Once you’ve curled them you should be able to just place your Hidden Crown, touch up a few pieces, and go! It’s SO EASY! 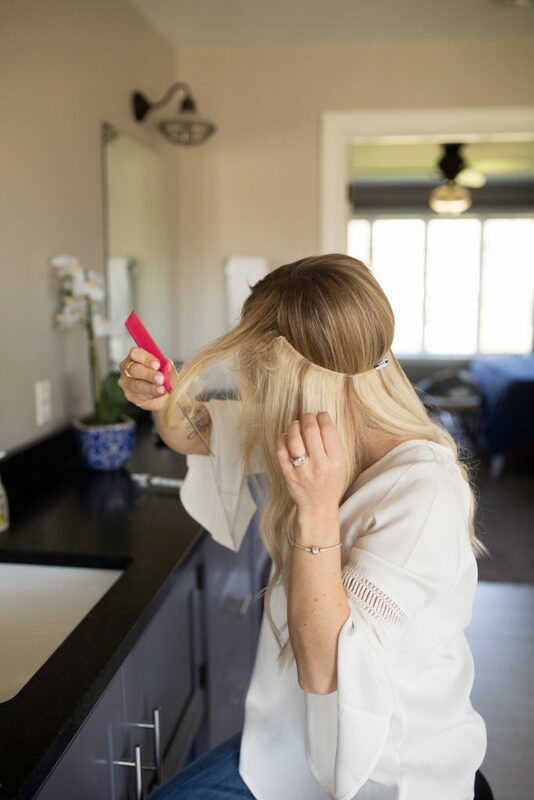 You can shop Hidden Crown Extensions here and find my hair tools and outfit links below! Thanks for stopping by and if you liked this post let me know by leaving a comment below – we love hearing from y’all! **Updated – I am currently wearing the Daydream 14″ in shade 882. I also have a set of the 14″ clip ins to use for my ponytails. There is a great video tutorial for how I do itHERE! I have been considering these for over a year. I am thinking I should get the daydream bc I havd thinner hair, so I think the others will be too much. Do you have to wash them as well? Do you ever dye them or do you know if you can? I think the daydream would do well if you have thinner hair. I’m considering ordering one too for the summer! I haven’t had to wash mine yet but if you use any hairspray on them you might want to every once in a while – but not often because they don’t produce oil like your natural hair does. I have not colored mine but they are super responsive so I might suggest you email them. I absolutely love mine and think they are definitely worth the investment! Can you explain what you meant when you said you rewired it into 2 separate strands? I really got confused and can’t tell by the pics what you mean! I’ve watched the videos but none talk about what you mentioned above! I definitely want to know more! Do you currently have the extensions? If not it makes more sense when you’re looking at them. You are able to re-do the wire with the extra they send and I just fed mine all the way through and tied them off on one side – so I’m left with two strands. I’m not currently but you can send it to me on Instagram just the same I believe ? Hi, I have these and am trying to get a proper fit. Do you find you get a small indent in your scalp from the wire? I’ve reworked mine a couple of times thinking I’ve got the right fit but there’s always that small indent. 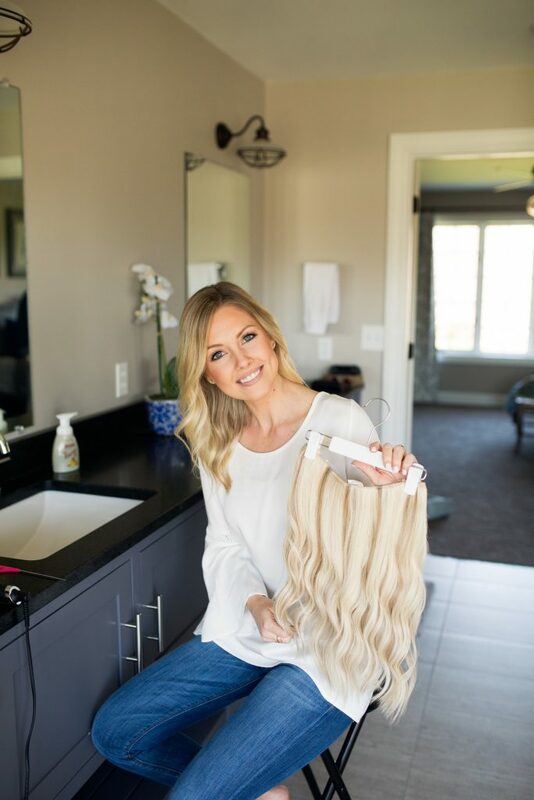 Your extensions look amazing! I’ve had that happen before but I just move the wire back and it seems to go away. I would try wearing them a little farther back and see if that helps! I am also confused on the double wire, I have thin hair and find that even the Daydream is somewhat heavy. More support with the double wire seems like it would help. Is it possible for you to demonstrate this?? I will try to get a pic of it later so you can see it better. Really I just looped it through instead of pulling it through one end and tying it off. So I took it back over to the side I started on so it looks like there are two wires.